ISTA is proud to be a democratic institution with opportunities for all members to roll up their sleeves and contribute to building and growing our Association. One of the most influential positions a member can hold in the Association is a statewide office. 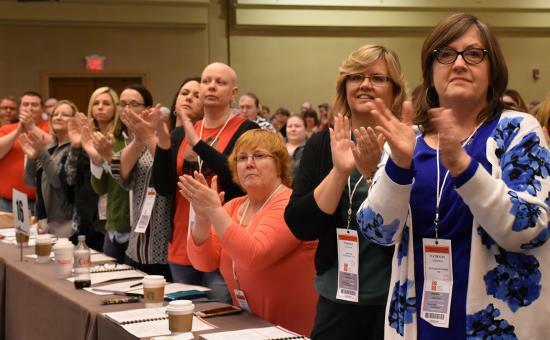 At the 2019 ISTA Representative Assembly (RA), there will be three open statewide positions – president, vice president and National Education Association (NEA) board of director. Interested candidates must complete a candidate form and statement by March 1, 2019. The president serves as the thought leader and spokesperson for all members guaranteeing member voices are heard at the Statehouse, in the media and reflected in the actions taken by the Association. The president maintains contact with local presidents, ISTA board of directors and committee members and coordinates governance operations of the Association and works with the executive director and staff to implement policy. The vice president assists the president in his/her duties as needed and serves as the chair of the ISTA Foundation for the Improvement of Education. The vice president also contributes to legislative and government relations activities as the liaison to the Indiana State Board of Education. The NEA board member serves as a link from ISTA to the national association. NEA board members review the policies and interests of the Association and act as decision-makers between annual NEA RA meetings. The board meets four times a year, plus one meeting in conjunction with the NEA RA and annual meeting. The election will take place at the ISTA RA, April 27, 2019, in Indianapolis. Candidate statements received on or before Nov. 3, 2018, will appear in the winter issue of the ISTA magazine mailed to all ISTA members. If a candidate statement is received after Nov. 3, 2018, the candidate statement will only appear on the ISTA website. For more information and to complete a candidate form and statement, visit ista-in.org/governing-documents. For questions, please contact Cheryl Cherry at ccherry@ista-in.org. Deadline to submit candidate form and statement to appear in the ISTA winter Advocate. Deadline to submit candidate form and statement.